CLEVELAND — When it comes to home improvement projects, choosing the right tools is half the battle. And now, Krylon®, the nation’s leader in spray paint, offers the perfect tool for outdoor painting needs with new Rust Protector™ Paint, which offers dry time in as little as eight minutes for performance you don’t have to wait for. Why is dry time so important? The longer paint takes to dry, the more chance there is for foreign particles, such as bugs, grass or dirt, to stick to the surface. And, for outdoor projects, where wind and weather are factors, fast dry-time is an extremely important attribute to consider when choosing a paint product. New, fast-drying Rust Protector is available in both sprays and brush-on formulas to meet any painting need. While the Rust Protector line offers a complete array of primers, the paint can be used direct to metal with superior results, unlike the competition. It can also be used on a variety of other substrates, offering superior corrosion protection, adhesion and durability. Additionally, the Rust Protector line offers a wide range of color and special finishes to meet most any outdoor project need, including: gloss, semi-gloss, satin, flat, metallic, hammered and textured, and in a broad array of colors and clears that are synonymous with the Krylon brand. 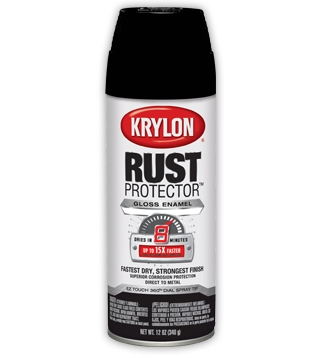 And, best of all, you won’t have to pay a premium for this innovative, fast-drying product: Rust Protector can be found at home centers and hardware stores at a suggested retail price of $3.97-$4.97 for spray enamels. Pricing for special finishes and brush-on formulas will vary. All Krylon aerosol paints are in compliance with the California Clean Air Act for Aerosol Coatings and the California Low Emissions and Reactivity Rule (CLEAR). For more home improvement tips, additional information about Rust Protector or any Krylon products, visit www.krylon.com.